On the surface they appear to be one of the simplest parts of the warehouse to construct. However, this simplicity often leads to underestimating design and construction requirements. A well designed and correctly specified floor will help building operators to increase productivity, reduce maintenance and lessen slip and trip risks for those using the floor. Making sure that the warehouse is equipped to undertake this activity safely and efficiently means carefully considering a variety of elements. A principle factor is ensuring that the floor maintains a flat, level and functional surface despite the movement of imposing loads, trafficking from hard rubber and steel-wheeled forklift vehicles and potential exposure to chemicals spillage. Should the floor finish fail then it instantly affects the on-site safety and operational capabilities of the warehouse while at the same time lowering the building’s value and incurring high repair or dilapidation costs. Floor flatness and levelness requirements are critical, especially for high ceilinged space and safe operation of high-lifting equipment. Floor Flatness is critical in the majority of warehouse floors, where the need to increase efficient use of space often means reducing aisle widths and selecting Very Narrow Aisle (VNA) racking systems. 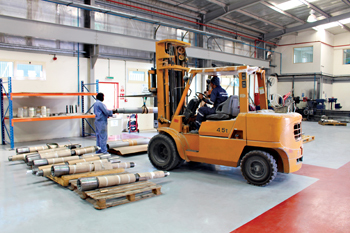 This in turn requires specialised VNA Lift Trucks or Materials Handling Equipment (MHE). These Lift Trucks allow the operator to travel up and down in a cab with the load. The clearance between the sides of the Lift Truck with the pallet it carries, and the Racking may only be 100 – 150 mm on each side. Latest generation MHE and Racking systems can reach heights of 18m or more. Surface unevenness can lead to excessive vibration on a lift truck and increase down time and repairs. Exact floor flatness is crucial to ensure operations are more effective if lift trucks can operate at maximum speed. With flat floors, Health & Safety is increased while operator tiredness is decreased. The risk of damage to stock is also decreased with no risk of racking collapsing as a result of uneven surfaces. Having the right building design and safety practices has always been essential to avoiding accidents in what can be a prime environment for serious harm to come to employees or damage goods in storage if the area is not properly managed. The slip resistance of the floor can be key to reducing the number of on-site accidents, as it increases traction underfoot. This can make a real difference in the areas where heavy foot traffic and spillages of lubricants, oils and fuel is common. Aggregates can be broadcast into resin floor coatings to enhance the floor’s anti-slip profile while maintaining an attractive, seamless coating. The aggregate size can be customised to match the specific requirements of individual sites. Broadcasting aggregates into a resin floor also has the added benefit of increasing its durability and lengthening its longevity by creating a much tighter matrix. Having a lot of free floor area is not just about the size of the building, but it’s also about how the floor area is utilised. Clever use of walkways, on-site navigation and workflow can all help warehouse facilities comply with regulations and make the most use of the available space. Some warehouse or distribution centres will be bound by regulations that require them to have clearly identifiable walkways and boundaries that must be kept clear for passage purposes. Bright and obvious signage on the floor is ideal for meeting this requirement and can also be utilised to designate emergency paths that improve the safety of employees. Clever use of floor signage can also help to maximise the available floor space by marking out the best positions for entry, exit or storage. Epoxy resin floor coatings have become a popular choice for warehouse and distribution centres thanks to the ability of these solutions to provide a robust platform that can withstand the on-site challenges over an extended period of time whilst providing additional operational benefits. Resin floor specialists can provide epoxy solutions that have been specifically tailored to resist imposing loads, hard rubber and steel-wheeled forklift traffic while at the same time ensure surface flatness. To avoid the potentially dangerous build-up of flammable liquids, the seamless nature of epoxy floor coatings facilitates easy cleaning that quickly removes spillages and contaminants from the area. Drainage systems can be incorporated that work alongside the site’s fire suppression system so that the foam rapidly flows away. 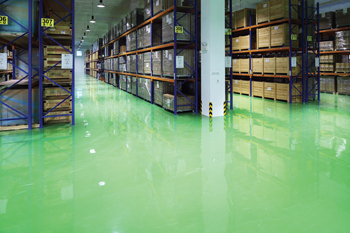 The bright, clear colour of epoxy floors helps to ensure a floor area that is not only aesthetically pleasing, but which also assists on-site maintenance by showing up dropped substances. Warehouse facilities can make use of the wide variety of colour options to differentiate between different floor zones for safety or work management purposes. Clear signage can also be incorporated into the floor to mark out crucial points and employee walkways or to aid workflow around the building and point out safety warnings. The UV resistance and resilience of epoxy systems means that the floor will retain its crisp colour despite extensive use in hot climates that have high levels of UV radiation. Its high abrasion resistance will even stop facilities having to worry about hot tyres leaving marks across the floor. Anti-slip aggregates can be included within the resin make up of an epoxy system to provide extra grip underfoot. The anti-slip profile of the floor can even be tailored to meet the varying requirements of different areas of the distribution centre complex. Flowcrete Middle East recommends a range of flooring systems for warehouse facilities including Flowcoat SF41, Flowcoat CR, Flowcoat SF150.